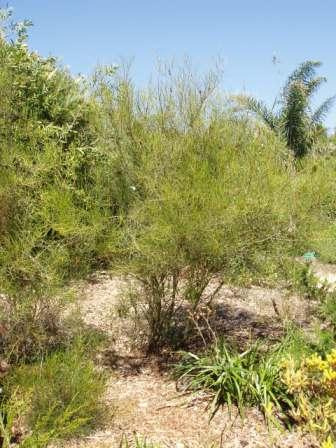 Small to medium shrub 5-9' with slender multiple branches, linear green leaves and profuse mauve-pink flowers appearing in winter-spring. Prefers well-drained soils in full sun. Tolerant of frosts and extended dry periods. Plants respond well to pruning. Tolerant of strong winds and is a useful low screening plant.